These drawings are printed in black on natural recyclable cotton 80 lb. cover stock and are blank inside. Cards are 4-1/2″ x 6-1/4″ with matching envelopes, packed in a clear-top white cardboard greeting card box. They are available in packs of 12 with three cards in each of the four images. Packs or boxes of individual images or different combinations are available on request. 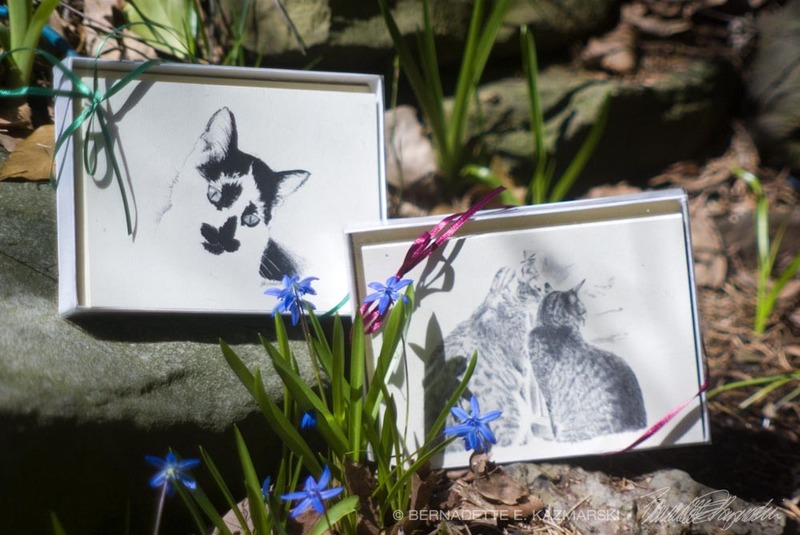 These cards were printed from a series of drawings I did just for fun years ago using photos from my massive cat image bank (calendars, magazines, books, old photos, anything else with a cat on it…). Use the links below to order the original set, a custom set, or individual cards.